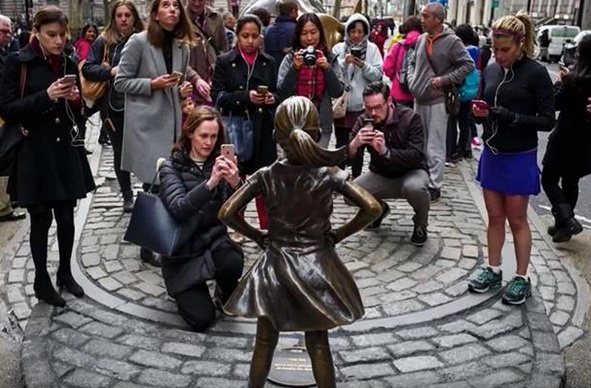 In March 2017, the statue “Fearless Girl” by Kristen Visbal, became famous after being left in the middle of the night to stand in an apparent face off with the statue “Charging Bull” in NYC’s financial district. 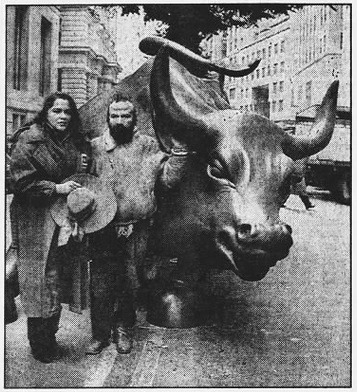 (© Charging Bull, Arturo Di Modica, 1989) The piece, and its relation to the bull, was interpreted as a kind of act of defiance, an anti-establishment piece of art of and for the people, etc. Many people went nutty for the statue. 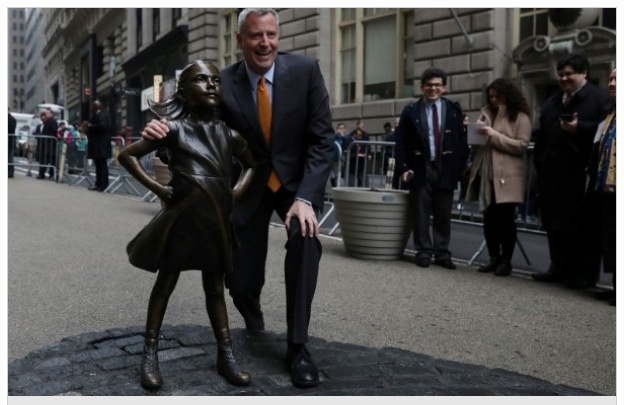 “Fearless Girl” was originally intended to stand for one week. Soon that week was extended to one year, with calls to let it remain permanently. NYC Mayor of all residents: men, women, girls. And statues. And it became as rallying point for those who wished to capitalize on its implied meanings. New York Congresswoman Carolyn Maloney even brought her own podium to the statue! March 2017. 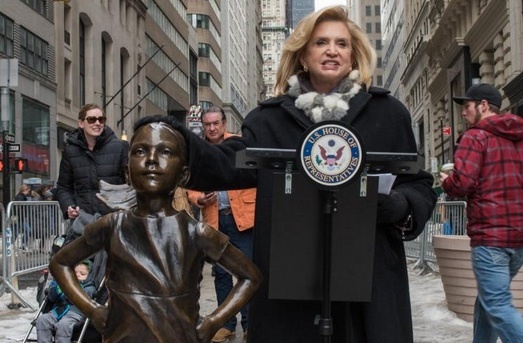 This statue has touched hearts across the world, with its symbolic depiction of the resiliency of women,” Carolyn Maloney proclaimed. “It has nothing to do with feminism,” Gardega said in response to his piece’s interpretation as being anti-woman (or girl?) He explained that his piece came as a response to the way that the “Fearless Girl” “disrespected” “the artist that made the bull. . . That bull had integrity,” he said in a NY Post interview. He explained that he “decided to build this dog and make it crappy to downgrade the statue, exactly how the girl is a downgrade on the bull,” said Gardega. Di Modica was absolutely correct. The reality behind the piece could not have been further from the truth reported by the mainstream media. “Fearless Girl” was actually a carefully coordinated product of the power structure itself. It was commissioned by State Street, a global financial services firm, in partnership with a global marketing company (Mcann). Not only was the company behind “Fearless Girl” a pro-corporate powerhouse, it was, according to a lawsuit, institutionally anti-woman. In October 2017, State Street settled a lawsuit by paying $5 million, “mostly to settle claims that it discriminated against 305 top female employees by paying them less than men in the same positions,” as the NYT reported. 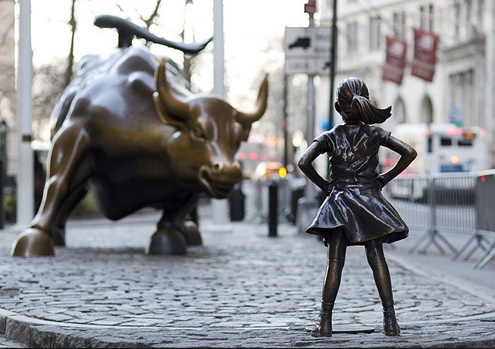 Ironically, the statue that “Fearless Girl” faces, “Charging Bull,” was in fact created as true “street art” or guerilla art. The artist, Arturo Di Modica, created the 3.5-ton sculpture over the course of two years in his SoHo Studio. The idea came to him after the 1987 stock market crash. The Italian born artist wanted to create an image that captured what he saw as the strength and vitality of his adopted country. 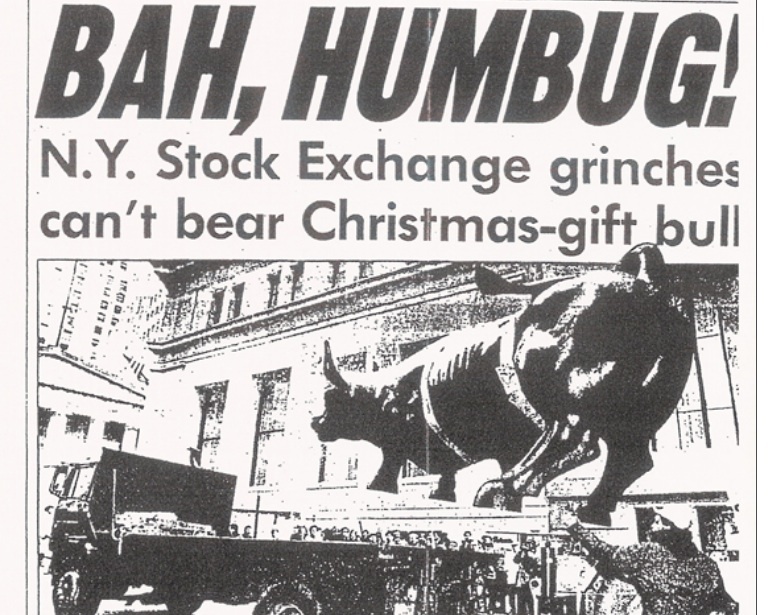 On the wee hours of December 15, 1989, he and some friends surreptitiously installed “Charging Bull” according to a carefully crafted plan to avoid being caught. They deposited the statue (using a truck and forklift) in front of the New York Stock Exchange. And since a huge Christmas tree had been erected by the city on the site, Di Modica left the bull as a “Christmas present,” he later explained. He had no permission whatsoever to install his piece of public art. People flocked to see it. Soon, however, the NY Parks Commissioner, with the backing of Mayor Ed Koch, decided that they were, in fact, bullish on Di Modica’s piece. It was installed on Broadway Street, near Bowling Green. Di Modica may have a point, to be sure. Objects and ideas are given new meanings according to new relationships. 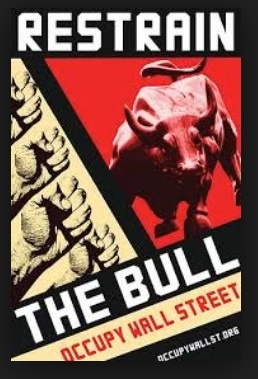 But in fact, in the aftermath of yet another financial crisis (2007-2008), “Charging Bull” had already been adopted into a new set of relationships and new meanings. 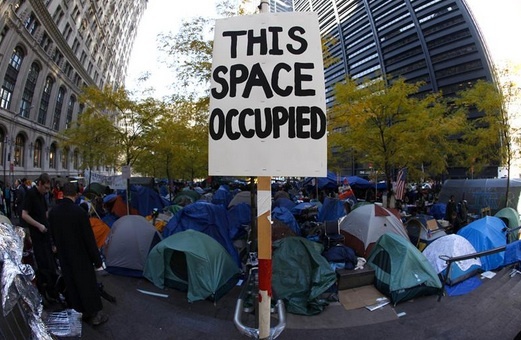 In 2011, it appeared in an image that launched a new movement (or at least coalesced existing movements): #Occupy Wall Street (and the #occupy movement it spurred). 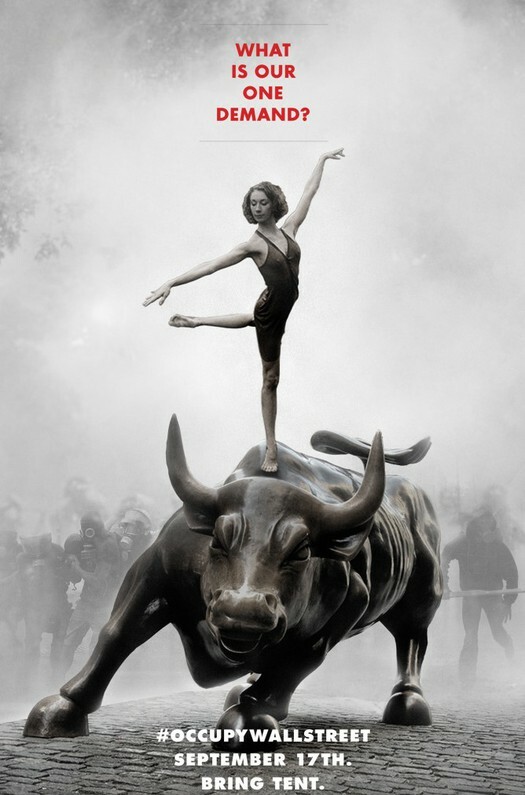 What followed was the appearance of the image of “Charging Bull” in a series of collages, cartoons, memes, and hashtag-connected ideas, along with all the other forms of imagery that populate and punctuate the virtual public square in order to make (and re-make) meaning. And of course, as the image of the bull multiplied, people also moved into the streets-physically-to occupy space in the real world. 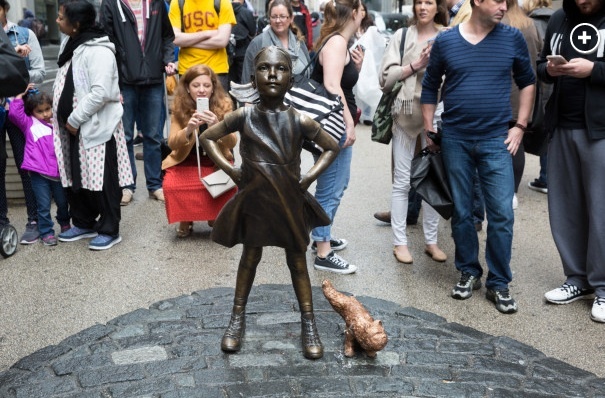 In April 2018, after a little more than a year into the “stand off,” “Fearless Girl” is being moved. NYC officials cited concern with the potential for terrorism on the city streets: the statue is drawing too much of a crowd and is becoming a “safety hazard.” Officials would also like to move “Charging Bull,” arguing that it too draws large crowds. In many ways the “public square” expanded on to the internet a long time ago. That’s a place where symbols morph and meme; images can exist to find new relationships, face contradictions or challenges, and space is endlessly claimed and reclaimed, created and re-created. Even long after the #occupy movement dispersed, the (physical) public square continues to be a contested site. As its meanings are policed by officials, and as artists and corporations vie for a place to take a stand, the square proves to be occupied still. *In a sad postscript: the artist Alex Gardega died in October 2017 after being struck by a subway train. Previous Lucille Ball and Desi Arnaz: Married at Last!